This is such a cute and fun book! I absolutely adored Stephanie Perkins' Anna and the French Kiss, so I pretty much had no doubts that I would feel the same about Lola and the Boy Next Door. The author does such a wonderful job of sucking you into the plot and making you really get into the dynamic characters. There are also several humorous moments and heartbreaking ones as well. This book has a mix of every emotion you could imagine! I really enjoyed Lola's character. She's a very eccentric, funny and eclectic individual who, for the most part, knows what she wants and goes for it. For a decent portion of the book I really felt for Lola because she's so torn between what she really wants and what she THINKS she wants; which is an emotion I am definitely familiar with. She thinks she has it all-- with a hot older boyfriend who is the lead singer in a great band-- but then a boy from her past comes back into the picture and she begins to feel unsure about her feelings. Luckily Lola has a great best friend and family, and with their help she gets through it all. 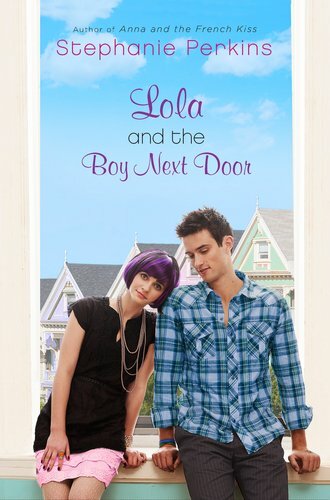 The boy from Lola's past is Cricket Bell, who is the outrageously adorable boy next door, and Lola was in denial about her feelings for him for a while in this book. I really wanted to smack her several times because she was being so blind and naive about her obvious love for him. These two have such a natural and undeniable chemistry and Cricket is just so cute and sincere that it's almost heartbreaking. His loyalty to Lola is incredibly astounding and sweet. As much as I am smitten with Cricket and Lola, one of my absolute favorite things about this book is the appearance of Anna and Etienne, from Anna and the French Kiss. I had heard that these two would show up in Lola and the Boy Next Door, but I had no idea that they would be as involved in the story as they ended up being. They popped up several times in the book and I was ecstatic!! I wish more authors would do things like this! This book has it all: first loves, family drama, a lot of laughs, cute boys, endearing characters, and a very truthful account of what it's like to be a teenager. I recommend this book to everyone, because I guarantee that it will leave you feeling giddy! She is able to write romance like crazycakes. Not crazy bodice ripper romance (which does have its merits) but sweet, adorable, sometimes tearjerker-y, bittersweet, awe inspiring, really pretty perfect romance. Quite a few social issues are covered in this book. But it never feels like either Lola or Stephanie Perkins are trying to force the issue or use Lola as a soapbox. They¿re all simply parts of the story and/or the characters¿ lives. I truly appreciate an author an author straying away from the cookie cutter norm (or what is usually seen as the norm even if it might not be) and doing it so well.